Ever since I came across a magnificent book called "When the Lion Feeds" when I was a teenager I have been fascinated by the books of Wilbur Smith. I have read every single one of them and always make it an automatic purchase whenever a new one comes out. His latest book, "River God" is the fifth book in his Ancient Egypt series. His previous book in the series featured Taita and lots of magic. This book has thankfully less magic though it is a sometimes incredible story. Taita is the most egotistic man that ever existed - he has an answer for everything and seems perfect in every way (apart from having no goolies). That aside, the book takes us from Egypt to Babylon to Cyprus and back to Egypt. 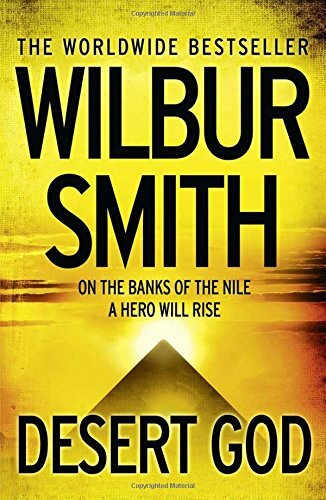 For Wilbur Smith fans it is true to form, but those new to Smith would do well to read the previous four novels in this series. For me, Smith was in his prime writing about South Africa and Rhodesia (Zimbabwe). He has been criticized for being racist and sexist - no arguments from me on this front. In "Desert God" there are no sweeping descriptions of the African landscape. The characters are weak, unlike the Ballantynes and Courtneys from his other books. I read this book on holidays which fitted the bill of an easy read while soaking up the sun. I wish Smith would revisit his roots and write again about the Ballantynes and Courtneys - but this is surely not to be in today's PC world. No doubt I'll buy the next Wilbur Smith book when it comes out - but he lost his touch a long time ago.